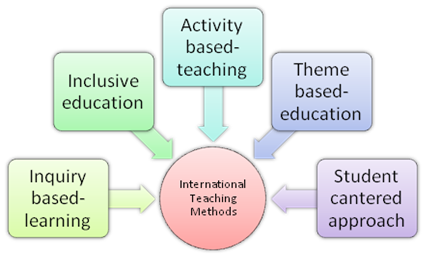 Activity-based teaching is the basis of academic methodology at BIMS. Extensive use is made of audio-visual techniques, computer-aided learning, visual aids, charts, models, games, role plays, projects, presentations, researches, worksheets etc. to stimulate the learning process. BIMS follows a practice of 'inclusive education' wherein we believe that every child is special and deserves an opportunity to a positive educational experience. Remedial help is offered when a child has a weak conceptual base that affects his/her academic performance in line with the expected learning levels. Theme based education teaches children through topics often relevant to the child, rather than isolated concepts. For example, we can teach children addition and subtraction in isolation, or make it relevant through a unit on markets where students and teacher explore buying and selling. Inquiry-based learning begins with a question leading to further questioning and exploration to arrive at a satisfactory answer.